Harrogate RUFC suffered a costly defeat to promotion rivals Lymm on Saturday, going down by a 10-3 scoreline in a close contest. 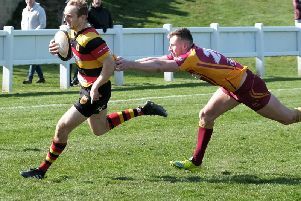 The game was one that director of rugby Dave Doherty had described as a “must-win” if the club were serious about securing an immediate return to National Two North. With Preston Grasshoppers pulling clear at the top of the table, the Rudding Lane outfit’s best chance of escaping the Northern Premier looks likely to be finishing as runners-up and earning themselves a play-off spot. Yet Lymm, who sit second in the standings, now boast a nine-point advantage over ‘Gate following a fourth defeat of the campaign, three of which have come at the hands of their three direct rivals for promotion in matches they could, and perhaps should, have won. The 3-3 half-time score in Saturday’s clash at Crouchley Lane was a fair reflection of an absorbingly competitive contest where both defences functioned effectively to contain some well-constructed attacks. Harrogate seemed to be playing up a distinct slope in the opening 40 minutes, but it transpired that this was an optical illusion created by the ground layout. The actual end-to-end difference is just three centimetres. An early ‘Gate attack was ended by a high tackle and an attacking line-out followed the penalty. Unfortunately for the visitors, Joe Watson, a former Harrogate flanker, stole the ball for Lymm. This turned out to be a temporary blip as the away pack dominated all exchanges for the rest of the half. A succession of driving mauls forced Lymm’s defence to go offside but the penalty attempt was unsuccessful. A promising Luke Riddell break was then halted, the ball went loose and Lymm counter-attacked. They managed to retain possession despite some aggressive Harrogate tackling until referee Mr Riley judged one of the tackles to be too forceful and Cormac Nolan’s penalty put the hosts ahead. A period of prolonged ‘Gate pressure followed. Martin Dodds, Sam Brady and Jonny Coser provided a string of line-out possession but Lymm’s desperate defence managed to hold out against some well-controlled driving mauls. Guy Coser then charged down an attempted clearance over the goal-line, but Lymm’s defence won the race for the touchdown. Still more Harrogate attacks followed and, when the home defence was again penalised, fly-half Luke White’s kick evened the scores 1t 3-3. The second period remained was a very tight affair but, while Harrogate definitely looked the better side during first 40, it was Lymm who held the edge after the break. The men from Rudding Lane still had the pack advantage up front, despite very significantly losing their two best forwards, the Cosers twins, whose dynamism was greatly missed. Guy Coser had to retire with a shoulder injury at the interval and brother Jonny’s game ended with an ankle injury sustained shortly after the re-start. Lymm saw more of the ball and used their possession well to kick for attacking positions and expose some uncertainty in the away defence. Harrogate’s attacking kicks were mostly too deep, well contained by the hosts’ sound defence and usually returned with interest. With the scores still tied and just a few minutes to go, Lymm scored a converted try from a forward drive to win the day. There was a suspicion that a supporting player was in front of Sam Mullarkey as he applied the finishing touch but the try was awarded, the extra two points kicked, and with little time for ‘Gate to mount a response, the game was effectively over. Up next for ‘Gate is a home clash with rock-bottom Morley this Saturday at the Stratstone Stadium.